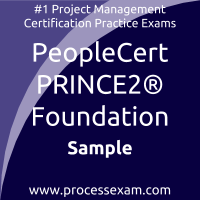 You have to pass the PRINCE2 Foundation exam to receive the certification from PeopleCert. To increase the effectiveness of your study and make you familiar with the actual exam pattern, we have prepared this sample questions. Our Sample PeopleCert PRINCE2 2017 Foundation Practice Exam will give you more insight about both the type and the difficulty level of the questions on the PeopleCert PRINCE2 Foundation exam. However, we are strongly recommending practice with our Premium PeopleCert PRINCE2 2017 Foundation Certification - Project Management Practice Exam to achieve the best score in your actual PeopleCert PRINCE2 Foundation Exam. The premium practice exam questions are more comprehensive, exam oriented, scenario-based and exact match of PeopleCert PRINCE2 2017 Foundation exam questions. 01. Which is part of the PRINCE2 definition of a project? 02. In which situation might the Controlling a Stage process be used? 03. Which is an objective of the Initiating a Project process? 04. What is risk probability? 05. The use of which level(s) of plan is recommended by PRINCE2? 06. Which is a recommended quality review team role? 07. How many tasks does the product-based planning technique describe? 08. Which is a purpose of a Quality Management Strategy? 09. What should be provided by a project mandate? 10. Which role is part of the project management team?